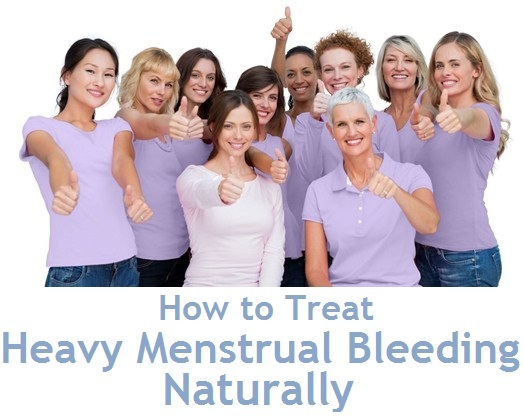 Heavy menstrual bleeding is concerned with the prolonged cycle and heavy bleeding along with clots. The medical term used for heavy or abnormal bleeding is known as menorrhagia. Some symptoms are generally showed during the menstrual periods through which one can identify the condition of its cycle either it may long or short such as the periods remain last longer than seven days, you need to change your pad every two to three hours again and again, severity in menstrual cramps on the lower abdomen during the cycle, large pieces of blood clots. Along with this, minor symptoms like shortness of breath, headaches, mood swings, nausea and weakness. This problem is highly affected to the young teenager women who are at their reproductive age or recently start their cycle and sometimes affected on those older women who are impending to the menopause stage. This condition would be due to the genetic means of transfer the hereditary bleeding disorder generation after generation. Women usually prefer to use the pills which lead to the thinning of blood. But this may take you to the huge risk. If we talk about causes so there are many different causes of menorrhagia that include, hormonal imbalance in the body, fibroids or noncancerous tumors of the uterus, miscarriage, ectopic pregnancy, uterine polyps, IUD (intrauterine device) for birth control. Other medical conditions may be adenomyosis, pelvic inflammatory disease (PID). Heavy menstrual bleeding is a kind of matter that relates with your daily life activities, your whole schedule of the day becomes disturb because you eventually take stress and become upset while thinking about the abnormality of your menstrual periods. It also can cause serious health problems in which one of the biggest problems is iron-deficiency anemia. Cold compress is a good way to control the heavy menstrual bleeding because it leads to the vasoconstriction method due to which your blood vessels start to be shrinking and tightening. According to this method, you will feel the reduced blood flow and minority in lower abdominal pain. Take a thin towel and put some ice cubes under the towel and tie it. Place the towel on your abdomen for about 20 minutes. Lie down for few minutes and try to relax. Repeat the remedy every 4 hours until you see the symptoms have gone. Blackstrap molasses is another important remedy to solve this problem because it is enriched with iron. The main benefit of this syrup is it can prevent the production of red blood cells and help in the regulation of the quantity of blood that has been lost during the cycle. Take a cup of warm water or milk and add 2 tsp of blackstrap molasses. Another thing that you can do is add ½ tbsp. of blackstrap molasses into a glass of lemongrass tea. Drink this tea once in the morning and another glass at night before laying down to the bed. Taking apple cider vinegar in the condition of heavy menstrual bleeding would be best. It works to flush out all the toxic substances occur in your body and helps in conserving the hormonal balance. Apple cider vinegar will also give you comfort in the state of cramping, headaches, irritability and fatigue. Take raw and unfiltered apple cider vinegar and add 2 tsp of it in a glass of water. Drink this solution at least three times a day during the menstrual cycle and then see the unbelievable results. The leaves of red raspberry are beneficial for that purpose. A substance is present in its leaves which is known as tannins that is recommended to strengthen the muscles of uterus and lowers the abdominal pain. Take 1 tbsp of dried red raspberry leaves and add them in a cup of hot water. Cover the lid and keep them on a low flame for 10 minutes. Strain the solution and drink this tea for 3 times daily. Remember to have this tea before a week of your menstrual periods. Cayenne pepper is also found to be great to control the heavy menstrual blood flow. It is an excellent ingredient which prevents and balances the flow in the body. Not only this, it also reliefs the menstrual cramps. Take a glass of warm water and add ½ tsp of cayenne powder in it. Now add a little amount of honey also. Drink this solution three times a day during your menstrual cycle. Cayenne supplements are also available so you can also take this after consulting your doctor. Coriander seeds improve the systemic changes happened in your uterus and helps in controlling the heavy menstrual blood flow during your periods. Take 2 cups of water and add 1 tsp of coriander seeds. Boil the solution until you notice the quantity is reduced to half. Strain the solution then add little amount of honey. Drink this solution when it is still warm during your cycle 3 times a day. Cinnamon is a common ingredient, easily available at everyone’s home. 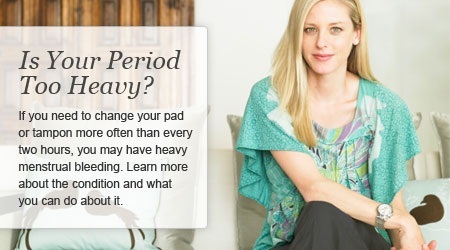 It is also recommended to use while you notice the heavy blood flow during your periods. Heavy menstrual bleeding is due to the abnormalities in endometriosis, uterine fibroids and adenomyosis. Cinnamon works to reduce the bleeding by stabilizing the flow of blood far away from the uterus. It also contains anti-inflammatory and antispasmodic properties to relief the cramps. In a cup of hot water, add 1 tsp of cinnamon powder. Slightly simmer the solution for some times. Alternatively, consume about 3 drops of cinnamon bark tincture 2 times a day. Cinnamon essential oil is also available at stores so you can also consume 30 drops of it mixed with diluted ¼ cup of water 3 times a day. Follow this remedy only during your menstrual cycle. Comfrey is scientifically approved herb which is also good to control heavy menstrual bleeding. This herb helps in compressing the blood vessels so the heaviness of bleeding is stopped. In a cup of hot water, put 2 tsp of comfrey leaves. Cover the lid and steep for 20 minutes. Strain the solution and drink it once a day while noticing the heavy menstrual bleeding. Add adequate amount of food containing iron in your diet. Iron is the important mineral necessary for women’s health and thus it also deals with the heavy blood flow during the cycle. It also helps preventing the iron-deficiency anemia. Add foods in your diet such as dark green vegetables, legumes, pumpkin seeds, egg yolks, liver, red meat, prunes, raisins. These all are fulfilled with the iron contents. Iron supplements can also be taken after the suggestion of your doctor. Magnesium is strictly recommendable for balancing the female hormones such as progesterone and estrogen. Sometimes deficiency of magnesium occurs in the body so it leads to the heavy menstruation. 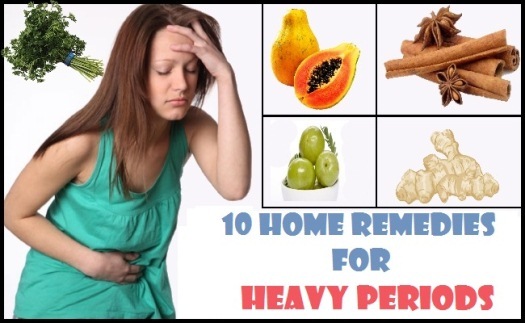 Therefore, it is suggested to take magnesium containing diet to reduce the heavy blood flow. Magnesium rich foods like oats, nuts and seeds, dark chocolate, avocado, pumpkin, squash and watermelon are all good to take while you notice the heavy clots of bleeding. If you need to take some medication, go to the doctor. Prepare a report of your menstrual flow. Keep the extra stock of clean pads and tampons on hand. While having cramps, place a hot water bottle on the lower abdomen to soothe out the pain. Drink few cups of chamomile tea, sage or green tea on the daily basis. Do exercise daily that include brisk walking, jogging, swimming and bicycling. To ease the menstrual pain, take a warm bath which will help your muscles to be relaxed. Try to make yourself comfortable as much as possible. Give a soft massage to your lower back using the warm coconut oil or olive oil to reduce the menstrual pain. Add these supplements to your diet such as zinc, calcium and vitamin B6, C and K after while consulting your doctor. Try to sleep for at least 8 hours daily. 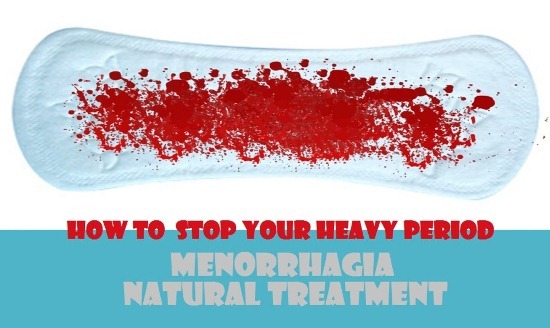 Do not lift heavy weight during your menstrual periods.